"There's always time for lubricant!" As of late, it has become popular to dismiss overly silly summer popcorn films as a throwback to the era of "B" grade motion pictures. Several films released in the summer of 2001 (including Jurassic Park III, Tomb Raider, The Mummy Returns) seemed fitting for this distinction, in the fact that each placed seeming everyday citizens against creatures from another time and place. Now comes Ivan Reitman's Evolution, a film which, on the surface, looks to be the most likely candidate for an homage to the Saturday matinee "B" picture; upon closer inspection, it is a pale imitation of recent films with similar subject matter. Evolution opens with a bang, literally. In the quiet night of the Arizona desert, prospective firefighter Wayne Green (Scott) is feverishly practicing for his upcoming test to become a firefighter when a meteor crashes, leaving his car, and practice facility, in pieces. 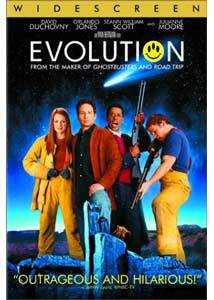 Soon, local community college professors Ira Kane (Duchovny) and Harry Block (Jones) are called in to investigate the meteor, and upon doing so the two make a startling discovery: Samples taken back to the school are evolving at a lightning fast rate that will soon spell extinction for humans. As is usually the case in this sort of movie, the military is brought in, and Harry and Ira are no longer allowed to continue their research. Ira, Harry, and Wayne are soon on their own to fight the creatures and save the day, but not without the help of the beautiful Dr. Allison Reed (Moore), a clumsy Army scientist who may just be falling in love with Ira. Taking more than a small amount of plot points from both Men In Black and Reitman's own Ghostbusters, Evolution suffers from a lack of originality in its plot. It is the script by David Diamond, David Weissman and Don Jakoby that causes the picture to fall apart in the third act. All of this is frustrating, considering that the rest of the film contained promise and marginal character development. This is all the more disappointing because other areas of Evolution work so very well. The look and feel of the film are enhanced by above average production design and special effects sequences. Production designer J. Michael Riva has wisely opted for vibrant color and exaggerated set design to help convey the feel and tone of 1950s genre movies. For the film's alien creatures, special effects master Phil Tippett has skillfully created several different creatures, each unique in their own way. From a seemingly quiet dog-like creature that unleashes an Alien-like figure when it opens its mouth, to an particularly nasty "triphibian" (as Reitman calls it in the commentary track) that looks like something out of a video game, Tippett's work here is very high quality. Each of these creatures moves with ease through their scenes, including a stunning use of CGI to make a flying alien move effortlessly through a crowded mall. Perhaps the strongest aspect of Evolution is the cast. At first sight, Duchovny looks to be stereotyped, but as Ira Kane, Duchovny takes a break from his television counterpart to bring a dry humor to his role. Alongside Duchovny is the immensely talented Orlando Jones (that 7-up guy) in a role that for most actors may well have been thankless. I enjoyed the chemistry between the two, as their dialogue goes beyond the droll banter that exists in other buddy pictures. Moore, who has what amounts to little more than a supporting role, looks beautiful and does a nice job. Seann William Scott once again portrays the same character he has in every other movie in which he has been involved. It is welcome that Scott chooses to carry over this character from film to film because he is getting very good at it. I enjoyed a lot of things here, but not enough to recommend the film. Taken for its cast and technical merits Evolution is successful. But ultimately the script is too flawed in the third act, too much so to overlook. Image Transfer Review: Presented in a 1.85:1 anamorphic widescreen transfer, Evolution seems out of place alongside other DreamWorks titles. That is not to say that the transfer is awful, in fact it is nearly flawless, just not quite on par with other discs from the studio. Colors are vibrant throughout, with the bright greens and other assorted colors on the creatures look wonderful. Night scenes feature good black levels, with sharpness and detail looking fine overall. The transfer suffers some problems in scenes involving the inside of the cave where the meteor has crashed, and edge enhancement is also occasionally distracting. Audio Transfer Review: Both DTS and Dolby Digital 5.1 mixes accompany Evolution and both are surprisingly active. Surrounds are constantly in use with either John Powell's score or the sounds of alien creatures moving across the room. The surround use in chapter 15 is especially dynamic, as the flying alien moves from one side to the other with seamless movement. Dialogue is crisp and clear, and the left and right speakers get the job done with nice separation. The .1LFE channel is active, with the film's closing moments offering room-shaking bass. A comparison between the two tracks yields little results, but using chapters 8 and 21 (both action sequences with surround use) the DTS track does come off a bit louder. The score seems crisper in the DTS mix also, as the picking of a guitar sounds much cleaner. A Dolby Surround mix is also provided in English. Extras Review: Though the packaging makes it appear that A Conversation with Ivan Reitman, David Duchovny, Orlando Jones, and Seann William Scott is a video interview, it is in reality an immensely enjoyable commentary track. From the outset it is obvious that Reitman wishes to control the group but can't, as Duchovny and crew offer several jokes about the production and each other. I especially liked the fact that Duchovny seems content in stopping the discussion in order to point out a trick with his hat that can be seen in the film. There isn't a lot that can be learned about the story or making of Evolution on this track, but I haven't laughed at a commentary this hard since I first listened to the one on Mallrats. The Evolution of Evolution is a fifteen-minute HBO First Look hosted by Orlando Jones and is largely promotional. The featurette offers interviews with cast and crew, which are often humorous and interesting, but the clip feels overly promotional with a lot of self-congratulating about the film. Much more interesting is Visual Effects, a ten-minute featurette that focuses on the creation of the creatures and their digital insertion into the film. I had hoped for a bit more on the process of creating the aliens from sketch to screen, but what is here is worth a look. Six deleted scenes, including an alternate ending are provided, and each is presented in anamorphic widescreen with the original aspect ratio of 1.85:1. In the commentary, Reitman states that every scene was cut somehow, and that is evident here. Several of the deleted clips should have been included as they are often funny, or they offer more insight into the plot. The alternate ending is the most enjoyable as it offers a sort of prologue to the story. A photo gallery of concept sketches for the aliens is included, with a plentiful amount of photos for each creature used in the picture. A selection of six scenes is offered with storyboards for those who wish to see the difference between concept and finished product. Finally there are cast and crew bios and filmographies for many of the principles and filmmakers. Though I have some problems with the film itself, this DVD from DreamWorks is wonderful. The commentary (not advertised) is among the best I have ever heard, hilarious from start to finish. The disc's video and audio transfers are very good. For those who enjoy the movie, it is a safe bet that the disc will delight, but for others a Saturday night rental would be just fine.